Heraldic crests of lions make powerful decoration on shirts and more. Get creative on your holiday projects! 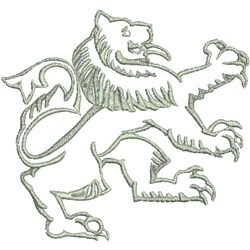 EStitch is happy to present Lion Decal machine embroidery design which has 23780 stitches and is [203.20 mm x 187.96 mm] large. If you would like to view more embroidery patterns please search on our embroidery designs page.